Our second physiotalk twitter chat of 2015 will be co-hosted by Mike Stewart (@knowpainmike) on Monday 19th January at 8pm (GMT). Metaphor lives a concealed existence all around us. 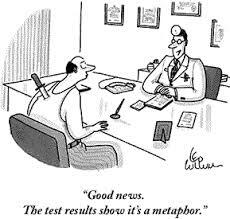 On average, we utter six metaphors a minute. Metaphorical thinking is essential to how we communicate, learn, discover and create meaning from the world. Yet the evidence that clinicians and patients speak different metaphoric languages is compelling. This session of Physiotalk will explore the influence that both verbal and physical metaphors have on our practice. To join or follow the debate, simply use the #physiotalk on Twitter (more info below). What are your experiences of using metaphor when communicating with patients? Are we making the best use of the metaphors that our patients generate? Is there a gap between our use of metaphors and our understanding of their influence on therapeutic interactions? How comfortable are we when facilitating creative use of metaphor through poetry, literature and song lyrics? Mike works as a Clinical Specialist Physiotherapist for East Kent Hospitals University Foundation NHS Trust. He is a full-time clinician and visiting university lecturer with over fifteen years of experience managing complex, persistent pain conditions. He is currently studying an MSc in Practice-based Education at The University of Brighton and is planning a PhD focusing on pain and metaphors. His recently published work on metaphors and pain reconceptualisation has received international praise from the leading names in neuroscience. In addition, he is a dedicated practice-based educator committed to providing practical, evidence-based CPD to a wide variety of health professionals through his award-winning Know Pain courses. It was a busy chat, thanks to Mike for such an interesting discussion and to all our participants. You can find the transcript here to read through at your leisure and Mike has posted a brilliant summary on his website here.